I’m not going to tell you who the main star is because if you know it spoils the fun a bit, mate. 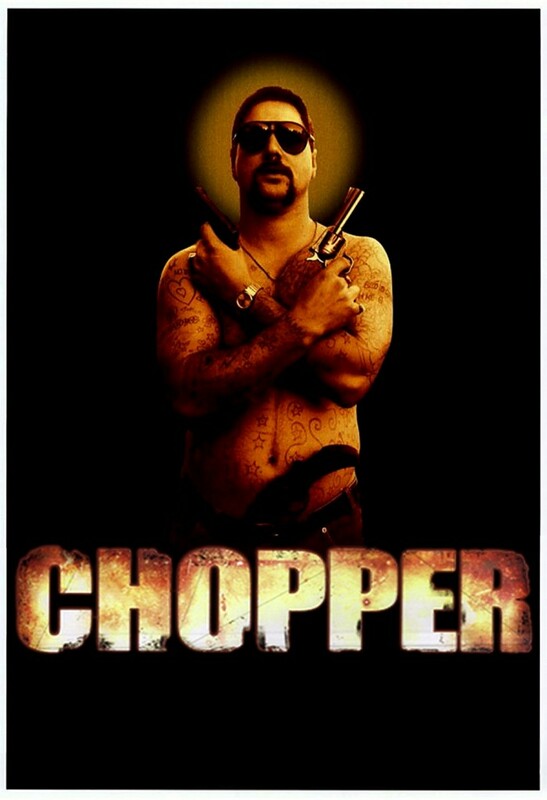 Chopper (2000) is the story of a sadistic, psychopathic criminal who became famous for his street rep and even more famous when he went to prison and became a tell-all celebrity whose exploits were told with a kind of fervid mania (Australians tuned in to see him and read about him because he was so wacko). It was the first feature film made by a very capable pro Andrew Dominik (his other credits are “The Assassination of Jesse James by the Coward Robert Ford” and the current “Killing Them Softly”) who has more style than not. Here’s a writer-director who has an ear for bizarre, surly lowlife language. Certainly a strange breed of man, Chopper often comments about himself in third person. You’re interested because you’re into crime stories and character studies, and well, this flick is a bizarre one-of-a-kind entry. The violence itself is blunt and indifferent, not built on exciting chases or showdowns. Dominik does more to focus in on character to make up for the fact that this was a low-budget indie – most of his framing is done with a planted camera with scenes that absorb in and around bars, alleyways and decrepit apartments that occupy druggies. Chopper, whether he appears to have a plan or not, hustles through the swine-infested Australian underbelly for a living. All the while you’re going, “Who the #$&% is this actor playing him!” If you do happen to know who it is, you’re still floored by the transformation because nothing else he ever did was as close to meathead as Chopper Read. If you don’t know, it’s vexing that here is an actor who has gone on to become a viable midrange star in American movies. Oh sure, if you must know, you can go spy imdb or Netflix for the actor’s name. Make your own spoil, will you. As for this article, this is the only time I’m not going to state a lead actor’s name in a review. The man of Chopper Read is an intricate, unfathomable mystery because he is too crazy to understand in a conventional way. His nickname itself is a myth with five or six floating theories as to why he became known as “Chopper.” Insights are limited on a man this deranged, but I will add this: Chopper did not appear to be an “organized” criminal. He had associates and a sewing circle, but really he was his own lone-wolf violent psychopath who pounced on the weak and exploited cash opportunities. One that could barely read. 90 Minutes. Unrated but for adults only. Film Cousins: “The Square” (2008, Australia); “Bronson” (2008, Britain); “Animal Kingdom” (2010, Australia); “Killing Them Softly” (2012).